So for a guy looking to see if the iPhone 4 will be worth while a good starting points will seem to be the new operating system. This is something that power users have looked for. The ability to switch between apps without having to close them down and restart them each and every time. As far as I can make out the apps places on the background are ‘frozen’ rather than still running so this not the same as on a PC. 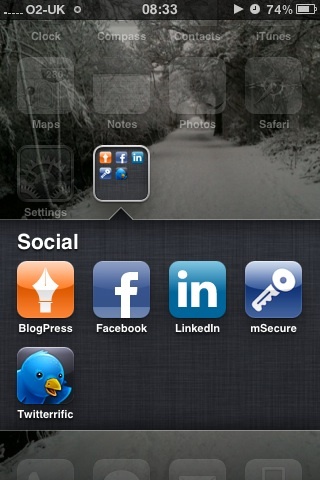 Some of my apps remember the last state even when closed so for these the advantages are small. Other apps, editors like this one for example, can now be minimised and returned to. This is a huge advantage when checking references or copy and pasting multiple items. “Closing” an app now simply places it in the background. This could lead to memory issues as the number of apps loaded and their size increases. Returning to an app is performed by double clicking the Home button. 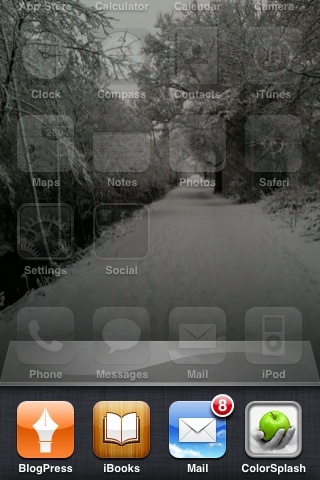 Swiping to from right to left show more apps that are current loaded, four at a time along a pop up bottom banner. The current foreground app is not shown. 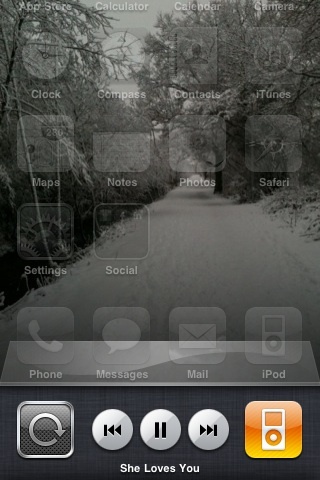 Swiping from left to right on the other hand will bring up the new iPod controller. 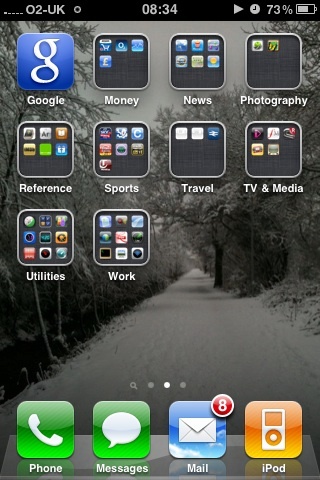 So far all my 90 odd apps seem to behave when frozen. The except appears to be remembering orientation. So apps do not support landscape on all screens so they default back to portrait. Also import is that Apple still have not provided a landscape version of the iOS screens, including the multitasking banner. The Mail screen has two sections, Inboxes and Accounts, each listing the appropriate entries. 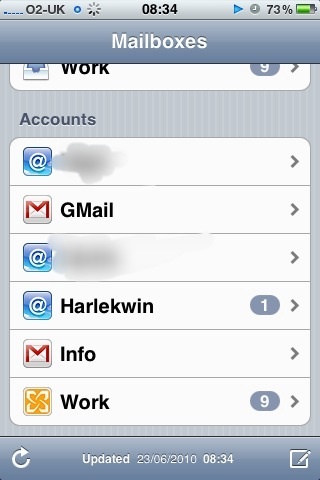 The latter gives you access to all your folders for the selected account, the form ONLY the inbox. 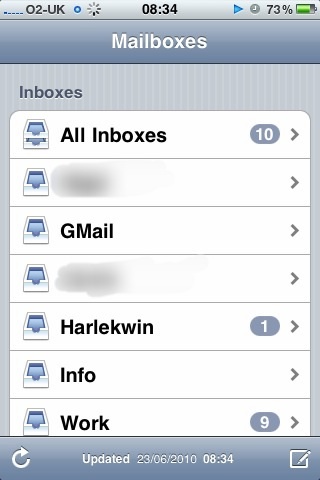 The list of Inboxes includes All Inboxes and there is a complete list of all Inbox mail. Includes is a To field but this won’t help if all you accounts are listed in you own contact book entry. Another improvement in mail is threaded conversations. This is good and cuts down clutter but the mechanism needs to be investigated. Ok, so you thought you had this already? Now you have two. You still have the auto correcting life saver essential to those using thumb pads but now if that still fails the mis-spelt word is under lined in red dots. Tapping such a word gives up to three, not always helpful, suggestions. 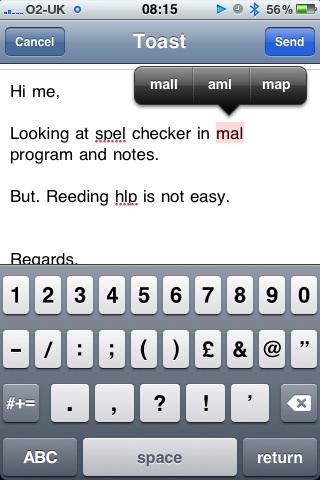 For example, typing “mal” gave the options mall, aml and map but not the more common (in my case) mail. This spell checker appears to be available in every text app – including this one. What happens with international differences? Well I am in the UK so Aluminium is correct and Aluminum incorrect and the latter is quite accurately underlined as as error! From nine swipes and a click to two swipes and two clicks. Whilst in the screen editor mode you can drag an icon onto another and thus create a folder. The system gives it a name based on the tags for the apps in question, gets it mostly wrong but you can change it there and then. The icons in the folders can be organised in the same fashion as any of the home screen views. Simple and efficient. Don’ know if I’ll be loading up 9000+ apps as a result though! Well this is a direct competitor for the library apps that already exist. That explains why you have to download it rather than I being patriot the iOS by default. So far it works well. Downloads sky favourite free book ( Adventures of Sherlock Holmes) and it’s legible and easy to control. The size of the screen will of course put some people off but that is the function of the iPad. Only slight quibble is that on my 3GS the bookshelf view takes a moment to load with books. I current have at least one app which refuses to run in iOS, ITV World Cup 2010, and some others appear far less responsive, Daily Telegraph World Cup 2010. Bit of a theme there. Digital zoom is an utterly pointless function that can be done in post production. They also appear to be some sync issues with a least one major mail provider due to the large number of people updating to iOS at once and being forced to perform a resync. As with other iOS updates the real test will be whether iOS kills the battery dead. All previous updates have had an impact on the battery life. I hope it was my usage pattern yesterday but I only got 3 hours out of the device before I was down to 15%. the update is worthwhile but not an absolute jaw dropper. The new background image is cute but inessential (though I myself asked for this) and the iOS itself still lacks a landscape mode. Hmm the question remains. I think the iPhone 4 will certainly be a huge step up for those that can afford it but the iOS4 on 3GS seems to work well enough. The new iPhone will certainly sell out but worth £500?